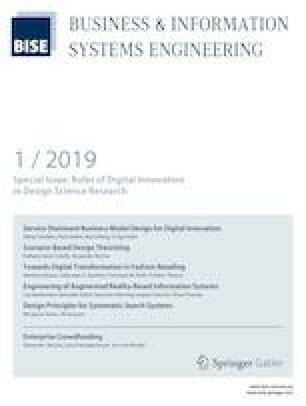 There has been a surge of interest in the design science research (DSR) paradigm as central to information systems (IS) studies in the past 20 years. The goal of a DSR research project is to extend the boundaries of human and organizational capabilities by designing new and innovative artifacts represented by constructs, models, methods, and instantiations (Hevner et al. 2004; Peffers et al. 2007; Gregor and Hevner 2013). Broadly speaking, DSR aims to add to knowledge of how things can and should be constructed or arranged (i.e., designed), usually by human agency, to achieve a desired set of goals. For example, design knowledge in the IS discipline includes knowledge of how to structure and construct a database system, how to model business processes, how to align IS with organizational strategy, and how to deliver data analytics for effective decision making (e.g., Becker et al. 2015). DSR results in IS have been shown to create significant economic and societal impact (vom Brocke et al. 2013). Beyond the IS field, DSR is a central research paradigm in many other domains including engineering, architecture, business, economics, and other information technology-related disciplines for the creation of novel solutions to relevant design problems. With its focus on the design and deployment of innovative artifacts, DSR is ideally positioned to make both research and practice contributions to the field of digital innovation (DI). Digital innovation is the appropriation of digital technologies in the process of and as the result of innovation. Digital innovation emphasizes combinations of digital and physical components to produce novel products (Yoo et al. 2010). In contrast to process innovation research, digital innovation research focuses on product and service innovation using digital technologies. Digital innovation is rapidly becoming a dominant topic and research focus in the fields of innovation, entrepreneurship, strategic management, organizational design, and information systems. The phenomena of digital innovation encompasses new digital technologies, information digitization, digitally-enabled generativity, and innovation management with a greater range and reach of innovation across organizational boundaries (Yoo et al. 2010; Fichman et al. 2014). Surveys show that organizations across a wide range of disciplines view digital innovation to be of vital importance (Fielt and Gregor 2016). However, we observe that there is little understanding and scarce literature on the relationships and synergies between DSR and DI. With this special issue, we present a set of DSR studies that show how DI artifacts are both produced by and used in DSR projects. In this editorial, we study the various roles that DI may play in DSR projects. We propose that the DSR paradigm provides formal and effective paths for demonstrating measurable impacts of DI in practice as well as contributing new DI knowledge to the appropriate discipline knowledge bases. The resulting framework provides a starting point for understanding the interactions between DI and DSR to the mutual benefit of both fields of study. Finally, we apply the new framework to the papers selected for the special issue highlighting the DI roles in each of the reported DSR projects. Information systems research consumes and produces two basic types of knowledge: (1) behavioral science-oriented research activities primarily grow propositional knowledge or Ω-knowledge (comprising descriptive and explanatory knowledge), and, (2) DSR-oriented research activities primarily grow applicable (or prescriptive) knowledge or λ-knowledge (Gregor and Hevner 2013). Contributions to the λ knowledge base typically comprise knowledge about technological (i.e., digital) innovations that directly affect individuals, organizations, or society while also enabling the development of future innovations (Winter and Albani 2013). Contributions to the Ω knowledge base enhance our understanding of the world and the phenomena our technologies harness (or cause). Research projects may combine both paradigms of inquiry and contribute to both knowledge bases. Descriptive (Ω) Knowledge: Ω-knowledge (or kernel knowledge) informs the understanding of a problem, its context, and the underlying design of a solution entity (Arrow 1). As results of the research project, the design and real-world application of solution entities or design knowledge enhances our descriptive understanding of how the world works via the testing and building of new Ω-knowledge (Arrow 2). Prescriptive (λ) Solution Design Entities: Existing solution entities, design processes, or design systems are re-used to inform novel designs of new entities, processes, or systems (Arrow 5) (vom Brocke and Buddendick 2006). 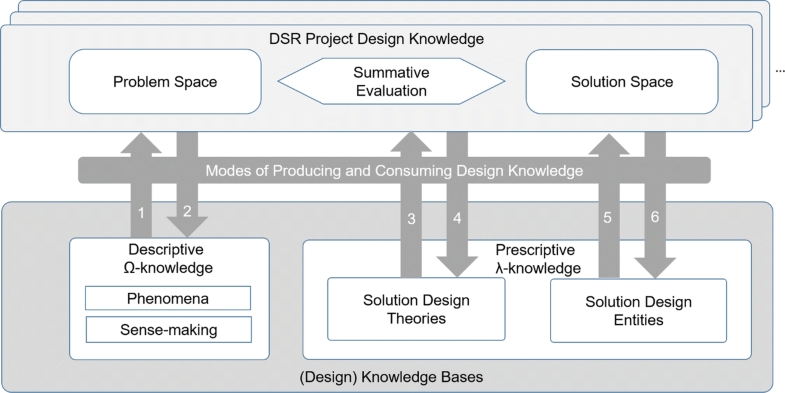 Within a DSR project, effective solution entities, design processes, or design systems are produced and contributed to new λ-knowledge (Arrow 6). Prescriptive (λ) Solution Design Theories: Solution design knowledge, in the form of growing design theories, informs the design of a solution entity, a design process or a design system (Arrow 3). Within a DSR project, effective principles, features, actions, or effects of a solution entity or a design process or system are generalized and codified in solution design knowledge (e.g., design theories or technological rules) (Arrow 4). Drawing from our experiences working on DSR projects involving innovative artifacts and from our knowledge of the extant DSR literature, we observe multiple roles that digital innovations may play in DSR projects. However, nowhere have we found a comprehensive framework that organizes and describes prevalent DI roles in DSR. In the following, we propose an initial framework with the description of six potential DI roles in DSR projects. A DSR project may include one or more of these DI roles. We further map the different roles to the DSR paradigm as shown in Fig. 2. A starting point of all DSR projects is to gain a full understanding of the relevant problem space and the pertinent descriptive theories that may inform the design of digital innovations in that space. We label this as Role 0 due to its fundamental nature in a DSR project. The research team draws from the current knowledge base of ‘kernel theories’ that provide the underpinning justificatory knowledge that informs problem understanding and solution artifact construction (Walls et al. 1992; Gregor and Jones 2007). Such descriptive theories are likely based on the study of previous digital innovations and their applications in interesting application environments. Thus, the use of descriptive theory around current DI to inform new DI supports a Role 0 use to understand the project problem space. The formative goal of a DSR project is the design of a novel technical artifact. In the field of information systems, that artifact will most likely be delivered in the form of digital innovation. A DI artifact grows through multiple cycles of build and evaluation activities (Sonnenberg and vom Brocke 2012) until it is ready to be introduced into the problem space and its new knowledge added to the λ knowledge base as a technical solution artifact (see Fig. 2). Depending on the maturity of the problem and solution environments, the DI contribution to the knowledge base can be totally new knowledge in the form of an invention, an advance on existing solution knowledge, or the exaptation of known solution knowledge to a new problem (Gregor and Hevner 2013, 2014). The DI artifact contribution in this role corresponds to Simon’s (1996) inner (or, interior) environment of the artifact. The inner design of the artifact builds the technical core (e.g., hardware, software) that provides the intended behaviors to the world via well-defined interfaces. Role 1 supports the design and implementation of a well-defined technical DI artifact and its introduction into the knowledge base of solution design entities. Most DSR projects not only produce a novel DI artifact but also the required processes and procedures for the deployment and use of that artifact in the problem context. These processes are novel ‘use artifacts’ that describe effective methods to make the best use of the DI artifact for problem solutions (see Fig. 2). Thus, the role of the DI artifact is as a pre-defined entity with the DSR goal being one of designing methods of its application to important problems. This role corresponds to Simon’s (1996) outer (or, exterior) environment of the artifact. The DI artifact interfaces provide the exigent opportunities for its application. We note that a single DSR project may iterate between the DI artifact in its Role 1 (internal technical design) and Role 2 (external use design) as it attempts to satisfy project goals. The new processes and procedures for use of the DI artifact are added to the knowledge base of solution design entities. Role 3 of a DI artifact is in its composition (perhaps with other DI artifacts) into a larger, more complex socio-technical system (Demetis and Lee 2016). The DSR project builds and evaluates the integration of the multiple DI artifacts into a new system to address different and, likely, more challenging problem contexts. The integrated system itself becomes a novel DI artifact that is added to the λ knowledge base as a solution design entity (see Fig. 2). Research issues of artifact compatibilities, interfaces, and integration become paramount in this type of DSR project. Thus, the DI artifact in its Role 3 plays a component role for the design of a more complex, integrated Role 1 DI artifact. An essential research activity in a DSR project is the reflection, learning, and design theorizing around the development of DI artifacts. The project captures prescriptive design knowledge from the DSR design cycles and from the introduction of the DI artifact into the problem space of the project. These solution design theories can be represented in multiple formats as knowledge for technology, action, integration, or process (see Fig. 2) (Drechsler and Hevner 2018). The goal of design theories in the form of nascent or mid-range theories is to grow understanding of the DI artifact for generalizing its tacit knowledge for future improvements and adaptations to new problem contexts (Gregor and Hevner 2013). Thus, Role 4 of a DI artifact in DSR provides a rigorous base for capturing solution knowledge in the form of solution design theories as a prescriptive research contribution. We would expect the use of a DI artifact in Role 4 to be combined in a DSR project with its use in preceding Roles 1, 2, or 3. Innovative artifacts are often used as creativity tools in a DSR project to provide new ways of thinking and doing in the design of novel artifacts. For example, the ideation activity in a DSR project can be supported with novel visualization tools (e.g., mind mapping tools) as digital innovations. Furthermore, specialized tools such as MyDesignProcess have been suggested recently to support entire DSR processes executed by (distributed) design teams (Morana et al. 2018). This DI role is termed an operant innovation resource by Nambisan (2013). In Role 5, a DI artifact acts on other resources to build and evaluate new designs. The DSR project would retrieve this existing DI artifact from the prescriptive knowledge base and use it in the DSR process of creating a new DI artifact (see Fig. 2). The five DSR projects presented in this special issue provide an interesting variety of how DI artifacts participate in different research roles. Here we briefly describe each of the following papers and highlight the roles of DI artifacts in each of the DSR projects. The authors claim that many digital innovations that exhibit smart mobility features require business-modeling support in order to achieve broader impacts in large-scale systems, such as smart city applications (e.g., Role 3). To this end, the Service-Dominant Business Model Radar (SDBM-R) is designed as a business-engineering framework. The goal is to better support the design of new business models for the incorporation of digital innovations for collaborative transport of people and goods. Thus, the design of SDBM-R itself is a Role 1 application of DI in the project, while the use of SDBM-R in the design of new business models is a Role 5 application. This paper studies the ideation process within organizations. A thorough survey of the literature on DI idea generation (Role 0), provides a set of criteria for idea screening. The authors design a Digital Idea Screening Cockpit (DISC) to organize and track ideas in organizations (Role 1). In addition, a new ideation process of generating, assessing, selecting, and tracking of how ideas become digital innovations is built around the use of the DISC tool (Role 2). Finally, the authors perform design theorizing around the DISC artifact to support its adaptation to the specific needs of an organization (Role 4). This paper presents a cyber-physical system enabling automated checkout in fashion retail stores. Automated checkout systems have the potential to reduce costs and in parallel improve customer experience. Building on different innovative digital technologies the paper follows Role 1 and designs an IT artifact that leverages hardware and software components to automatically detect purchases. The design of the artifact takes various constraints such as privacy and reliability under consideration. The evaluation of the artifact in a laboratory environment shows that shopping baskets can be detected in an efficient and reliable way. This article focusses on digital innovation facilitated by augmented reality glasses, and, following Role 1, it provides several artifacts to support the development of augmented reality-based systems. The authors first take a domain specific lens investigating 36 use cases for augmented reality in the logistics service domain, so that their work also incorporates Role 0 providing a detailed DI problem understanding in a specific domain, which they operationalize by means of meta-requirements. They derive design principles as well as an architecture for augmented reality-based system design in the logistics services domain, which outline principles of form and function and, thus, according to Role 4, mark important contributions towards the development of DI design theories. Applying concurrent evaluation, the authors develop a number of prototypes and, based on their observations from these projects, derive a more general framework for the augmented reality glasses implementations, which following Role 1 serves as a technical DI artifact. They discuss their findings and outline future research opportunities. This article investigates how to design innovative artifacts to facilitate systematic searches on research literature. Existing systematic literature search systems (SLSS) are studied to build a set of meta-requirements for an improved artifact (Role 0). A prototype SLSS, LitSonar, is built and evaluated via several controlled experiments (Role 1). Finally, a set of design principles for effective SLSS is proposed to guide the development of innovative search systems in different application contexts (Role 4). In this editorial, we have discussed the many roles DI plays in DSR, and we have shown that, in turn, DSR is ideally positioned to make both research and practice contributions to the field of digital innovation. Based on the DSR knowledge consumption and production model, we have derived six specific roles of DI in DSR: Understanding of the DI Problem Space (Role 0), Design of a DI Technical Artifact (Role 1), Design of an Artifact for Deployment and Use of a DI Artifact (Role 2), Design of a Socio-Technical DI System (Role 3), Development of Design Theories Surrounding a DI Artifact (Role 4), Use of a DI Artifact as a Creativity Tool in the DSR Solution Process (Role 5). We have used these roles to characterize the five articles on DI in DSR presented in this paper, and the papers, in turn, illustrate the six roles we have introduced. We very much invite fellow researchers to contribute to the exciting research fields in the intersection between DI and DSR, and we very much hope that this special issue will give many examples of the manifold research opportunities. We would like to cordially thank all colleagues who have supported this special issue in roles of reviewers and editors. We highly appreciate the strong support of our community in making this special issue happen.